So often people on the outside looking in, trying to understand what it must be like as a person with albinism, find it difficult to understand the aspect of “acceptance… beyond the skin we are in”. Many believe that having white skin, coming from a minority background, entitles us to resources beyond their reach. Often persons with albinism are perceived as either “ALL’ having low self esteem and being easy targets or as having a “superiority” complex, in regards to possessing such a fair complexion. These things can promote a vast misunderstanding and prevent people from getting to know persons with albinism for themselves. Coming from an African America background this can make life tremendously unbearable, because we are more than the skin we are in. It is in these times that having an upbeat personality can change these potentially negative experiences into meaningful ones. Character and reputation are not the same and because persons with albinism were created with distinct differences, it is up to us to decide how to “positively” highlight these characteristics. Preferences and interests play a large role in the interpretation of experiences, however all individuals have to find a comfort in who they are as an “individual” to overcome the adversity that may present itself, as a result of living with this condition. The Albinism Alliance Group (TAAG) is dedicated to building a supportive network that harnesses the value of positive character and we advocate for allowing it to speak louder than stereo types and myths. There are so many talented members of the AB community and this organization is taking time to salute them. We will interview as many people as possible, in order to create change in how persons with albinism are perceived. 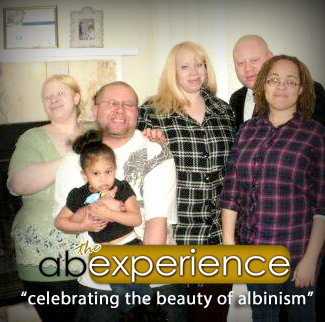 Truth: Albinism affects all ethnic backgrounds and cultures, individually and mixed. A person can be of multiple races and still have albinism. Limitations associated with albinism are more prevalent with societies misunderstandings of what it means to be a person with albinism. Everyone is not looking for a handout and no one requesting special treatment. Making an environment accessible is a necessity! Low vision is the gray area, contrary to popular belief, one is not “Blind” just because he or she can NOT see, as well as the next individual. Being classified as legally blind is common among persons with albinism and this does affect the quality of a persons life. Not being able to have the speed and accuracy in many detailed/hand/eye coordinated tasks may also negatively affect ones confidence. The difficulty in communicating this frustration should be understood, but also combated with “viable” solutions. Yes, contact lenses/prescription sunglasses/eye glasses with transitions and/or tint/ cc tv’s, onscreen magnification, bioptic lenses, para transit, taxi cab, cane or seeing eye dog (in extreme cases) are ALL an options, but there are NO corrective measures for the vision of persons with albinism. Most capacities range from 20/40 to 20/400. EVERYONE IS DIFFERENT and each person, albinism or not, set their own parameters. Allowing persons with low vision an opportunity to familiarize with his or her environment and to try different assertive technology tools, are fair ways to level the playing field. Most people simply want the opportunity to put their best effort forward. if someone is prejudging capabilities and placing limitations without regard to an assessment of true aptitude then this is not feasible. In the big scheme of things, it doesn’t matter what someone else “thinks” that a person can do its what that person believes he or she can do. The confidence to try comes from the ability to access the opportunity on a level playing field. All visually impaired persons are not the same and all persons with albinism are not the same. Myth: “True Albinism” in humans are represented by pink or red eyes…. Truth: eye color for persons with albinism run the gamut. from dark brown to blue. Many social and personal adjustment articles focus on non-acceptance from others, but The Albinism Alliance Group wants to expand this perspective because it is more important that an individual is more accepting of him or herself. We are all directly or indirectly impacted by our environment, but with a positive support network and a platform that gives a voice to the community, we gain the ability to change our environment before it changes us. Early intervention programs which offer the opportunity to familiarize children 0-3 with their surroundings, offer parents techniques useful in helping a child with low vision/albinism learn in any environment. This is but one way to build the confidence needed to compete in meaningful ways. Working with the children while they are young provides good measures which they may refer to as they enter post secondary education settings and effectively compete in employment. Myth: Persons with Albinism are blind… and mentally challenged. Often a lack of understanding regarding genetics which are involved in the chances of producing off spring with albinism can contribute to a lack of acceptance by a child’s parent(s) and/or extended family. In communities where counter parts have more color, often the difference is so vast the child is perceived to be of a different ethnicity. This can lead to a lack of care and concern or destroy communication without the right information from doctors, counselors and other informational resources. The Albinism Alliance Group (TAAG) wants to be avaialble to provide contacts and information to help ease the transition into parenthood under these circumstances and more. Children are very aware of their surroundings and learn by watching and listening to what others do in his or her environment. They do not need be able to speak or communicate verbally to understand the way they are treated… As human beings we know what feels comfortable vs. being rejected. A big portion of social adjustment is learning who cares by who meets your needs. We all need affection, interaction, communication, and positive attention to develop appropriate emotional responses. As small children things are done up close and personal. Living with low vision can be combated with the same thought process. By doing so, this may reduce missing visual cues and allow the child to readily interact with his or her environment. A combination of consistent rejection through avoidance, teaches a non acceptance of self. Often one or more parent may feel they don’t know what to do for a child with albinism, especially after a doctor has potentially shared disheartening news of the child’s inability to function at a normal capacity… Positive encouragement through play, verbal and non verbal communication can counter the development of a negative self image. Remember that body language and facial expressions speak volumes. Interacting with your child is the best way to show love, in return he or she learns to share what they have received. Truth: There are different types of albinism and different causes. Socialization and excellent people skills are something that anyone can possess and are the key to successfully managing obstacles with low vision and perceptions of persons with albinism, in unfamiliar territory. Although taunting and teasing are noticeably more prevalent when physical differences are apparent; Parents, extended family, and friends can reduce the dismay on initial non acceptance that may be encountered if their young ones with albinism experience this. . A good support network is an awesome way to combat many social adjustment issues associated with albinism and characteristics of the condition. Albinism is not a disease nor is it a disability, but the way an individual is treated as a result of living with this condition can be crippling. Sheltering your child may foster a co-dependent environment which may not allow them to effective adapt to new environments or independent situations. While we must provide positive support, fostering false confidence based on outward appearance or external vices, brings more harm than good. Being objective and honest but articulate and kind, are a few measures for communications which encourage. Finding something we love about ourselves that is exist beyond circumstances…. a non conditional part of “you” which creates a passion that cannot be suppressed, can make the difference in how a person approaches life. This one or more things can be the “push” that allows a person to live his or her dreams and because it is inside of you, circumstances can’t destroy it. Changing the outside does NOT change the inside, while making features easy to determine… can help others feel comfortable, as an individual one has to find comfort with in him or herself. Acceptance of one self is the ability to put aside reputation and perceived perception by others. Good character does not consist of verbal declarations, but choices made by an individual communicated by positive behavior. Overall parents must assist their children in making positive choices that reflect who they are to become, but as adults we all have to decide what is right for our lives. Networking with organizations such as The Albinism Alliance Group and getting your children connected with other children with albinism can make all of the difference. Hats off to getting educated about albinism and salute to those of us with albinism who courageously share our experiences to empower the next generation.